The principal method of high-quality tube-bending today in which the bend is formed by drawing the material around a rotating bend form. Specifically, the forward tangent of the tube is clamped to the bend die and is drawn around the die as it rotates while the back tangent is held in place against the rotating bend die by the pressure die. Thus, the point of contact between the rotating bend die and the pressure die is the line of tangency. 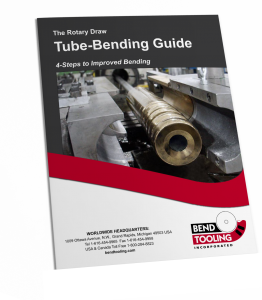 What distinguishes rotary-draw bending from other methods is that this line of tangency is fixed in space; therefore, mandrel and wiper tooling can be fixtured at the point of bend to fully control the flow of material. This control helps to produce tube bends of superior quality.